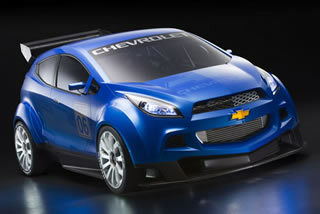 The ready-to-drive concept car set to premiere in Paris was developed by a GM team around the globe. It is the vision of a new generation of touring car- a design icon that bends the present WTCC regulations. In line with Chevrolet’s diesel offensive, the compact WTCC Ultra is equipped with a powerful 1,991 cm3 diesel unit generating 190 bhp. The basic version of the four-cylinder engine is the common rail unit with four-valve technology and variable turbine blade geometry currently powering the Chevrolet Captiva and due to go into the Epica from spring 2007. The increase in performance was achieved by raising the turbo boost pressure.